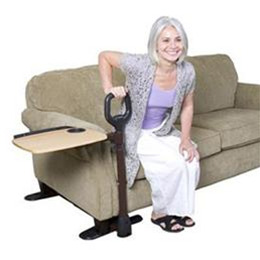 Height of Tray 26" to 32"
Height Adjustment Handle 34" to 40"
Base Length Adjustment 20" to 36"
Base Feet Measurements 4" x 7"
Weight Limit of Tray 30 lbs. Weight Limit of Handle 250 lbs. Case of 2 Dimensions 29" L x 29" W x 8" H: 50 lbs. Package Dimensions 29" L x 19" W x 4" H: 25 lbs.